Speaking to reporters late Monday afternoon after hours of testimony on Capitol Hill, fired FBI Director James Comey dismissed criticism that the Bureau's damaged reputation has anything to do with him. "That damage has nothing to do with me," he said. He then went on to slam Fox News and placed the blame for the FBI's tarnished reputation on President Trump. As a reminder, Comey is under investigation by the Department of Justice Inspector General for allegedly leaking classified memos to the press. The memos were written by Comey after meetings with President Trump. 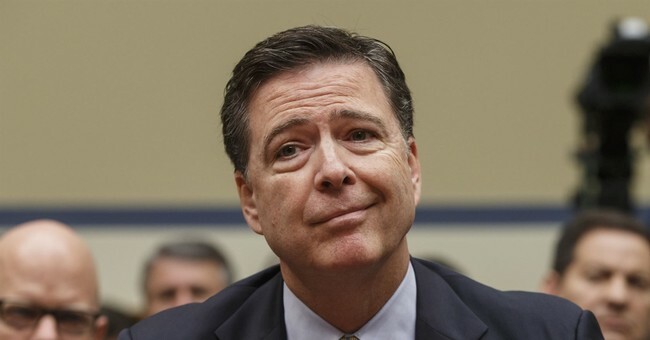 "I woke up in the middle of the night on Monday night, because it didn't dawn on me originally, that there might be corroboration for our conversations, might be a tape, my judgement was that I needed to get that out into the public square and so I asked a friend of mine to share the content of the memo with a reporter," Comey said during congressional testimony last year. "I didn't do it myself for a variety of reasons, but asked him to, because I thought that it might prompt the appointment of a Special Counsel. I asked a close friend of mine to do that." He's also under fire for using a private gmail account to conduct official FBI business. During a recent interview with MSNBC, Comey admitted to breaking FBI protocol and taking advantage of a "chaotic" Trump White House in order to interview former National Security Advisor Michael Flynn. In recent months, a number of unusual double standards have emerged about how differently Comey handled Flynn versus former Secretary of State Hillary Clinton's gross mishandling of classified information. He has testified twice in the past two weeks about the differences, but has argued more than 300 times he "can't recall" or "doesn't" remember specific details of the Clinton case.